Annyeong! *makes the obligatory tiny heart with my thumb and forefinger* What are two things lots of Filipina women love? Whitening products and anything Korean. K-dramas, Korean food, Korean boy bands, you name it. And of course, getting that sought after Korean complexion - fair, glowing, and flawless. 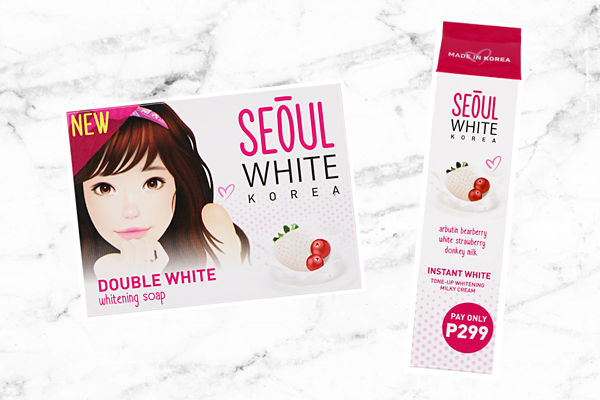 Seoul White Korea steps in to give the best of both worlds by coming out with two, whitening skin care products for every Filipina looking to achieve that fair, chok-chok (dewy) look. It's their Double White Whitening Soap and Instant White Tone-Up Whitening Cream. First up, we have the Double White Soap. It's sold four different ways. A small 60g bar for Php39.00, a 90g bar for Php60.00, a set of two 60g bars for Php65.00, and a set of three 90g bars for only Php125.00. What I'm holding is the 90g one and it's about the size of an average bar of soap. Bring out the effortlessly beautiful SEOULista in you! 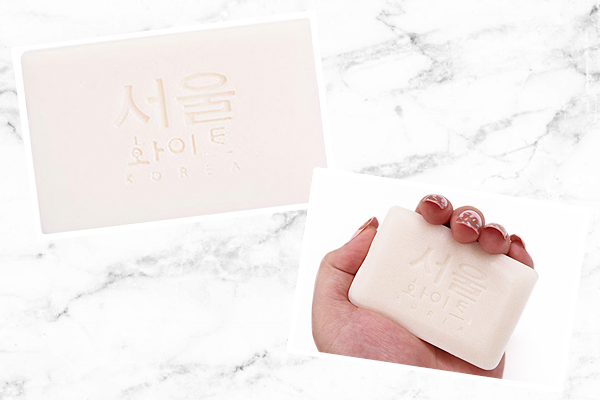 Discover a new level of healthy white that’s touchably-soft with SEOUL WHITE WHITENING SOAP. With white strawberry infused with whitening kojic berry. Moisturizing creamy latther draws out dirt and pollution and gently exfoliates. Helps lighten skin, dark spots, and acne marks while leaving skin touchable soft." Okay, this soap smells divine! When I first took a whiff of it at Sample Room's launch for these products, I was super excited to shower with it ASAP. The scent doesn't really linger on the skin after you shower, but I do love smelling it while I'm lathering up. Also, unlike many other whitening soaps I've tried before, this doesn't dry out my skin and actually adds a touch of moisture like it promises. No need to lotion up after if you're in a hurry! To reap the full benefits, I leave the soap on my skin for 3-5 minutes before rinsing it off. I haven't really noticed a whitening effect (on my body), then again I already have fair skin so I don't expect to see very obvious results. It does make my skin feel nice and soft after each bath though, that combined with the berry scent, makes me love this soap enough. Whitening arbutus bearberry - A natural form of alpha arbutin, a powerful but gentle skin brightening, it's also dubbed as "the new kojic acid". White strawberry - Known to have an SPF-like effect to protect the skin when infused in skin care, it also acts as a natural exfoliant for a double whitening effect. Donkey milk - Found to be superior to cow's milk, it's been nicknamed "white gold" and has four times the vitamin C. It's historically known to be extra nourishing and moisturizing on skin. 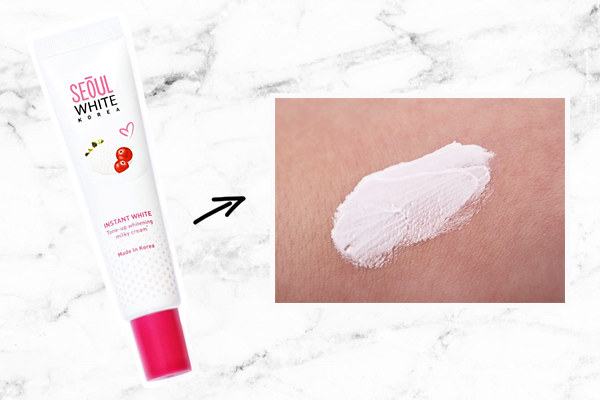 The cream itself comes in a 20g tube and has a pretty thick but creamy formulation. I thought this meant it'd take some time to properly spread out and absorb but it surprisingly doesn't! I applied the cream on the back of my hands and arms since they're the darkest parts of my body and in just one application, it instantly lightened my skin. I was doubly impressed because this is the first ever whitening skin care product to do that for me. No joke! I always aim for a more even-toned complexion, so I apply this on my hands and arms after I shower and before heading out to give me that immediate lighter and even-toned effect. I don't get the same results on my face, but that's only because my face is naturally quite pale. The only way it can get any whiter is if I splashed actual donkey milk onto it. Haha! It does brighten up my face a little though, so I still do apply it to my face too. It's not as moisturizing as I hoped, but it does a decent enough job in that department. Since I have little to no time to apply makeup in the morning before work, this cream helps make my skin look fresher and boosts my complexion a little overall. I just wish it had SPF so that I could skip sunscreen if I'm running late. Fingers crossed too that they come out with a big bottle of lotion with the same ingredients and same effect so that I can use it everyday! A 20g tube is fine for one's face, but I'd use it all up quickly if I applied this daily on my hands and arms. Seoul White Korea is currently available in Philippine Watsons stores or you can shop directly from their official website. You can also try both the soap and tone-up cream for FREE from Sample Room. Just pay for shipping!